• NOW HIRING: Check out one of the many career opportunities with the LASD and start the process of joining our team, right from your Smartphone. • ALERTS: You can sign up for alerts that will be delivered directly to your cell phone. • SUBMIT A TIP: Be the eyes and ears of the LASD by submitting anonymous tips to help fight crime or report suspicious activity in your neighborhoods. • CONTACT US: Send a non-emergency question directly to LASD 24/7. • INMATE INFORMATION: Locate information on someone in custody or schedule a visit. • EVENT CALENDAR: Find out what events are occurring across the county with LASD and schedule them right to your calendar. • CRIME MAPS: View maps of criminal activity in your neighborhoods or across the county. • PRESS RELEASES: You can view all official press releases sent out by LASD through the Newsroom. • DIRECTORY: Our directory provides you with a list of contact numbers within our Department and allows you to quickly connect through your phone. 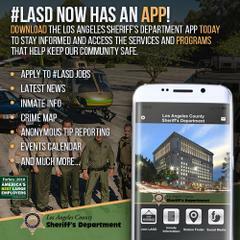 • SOCIAL MEDIA: You will have access to all LASD’s social media platforms through our app. • FILE A REPORT: You will be able to make certain types of crime reports directly from your mobile device. • LINKS: Click on “Links” to find information about other County departments and area agencies. More features will be added in the future, so please select automatic updating when you download the application. You will find our app in the Apple and Android app stores by searching “Los Angeles County Sheriff'”.